The newspaper headline reporting Hotel Belleville’s dedication correctly observed that “Hotel Belleville Stands as a Monument to Its Builders.” The four-year effort to construct a first-class hotel in Belleville culminated with a dinner reception in 1931 that drew 1,000 guests. 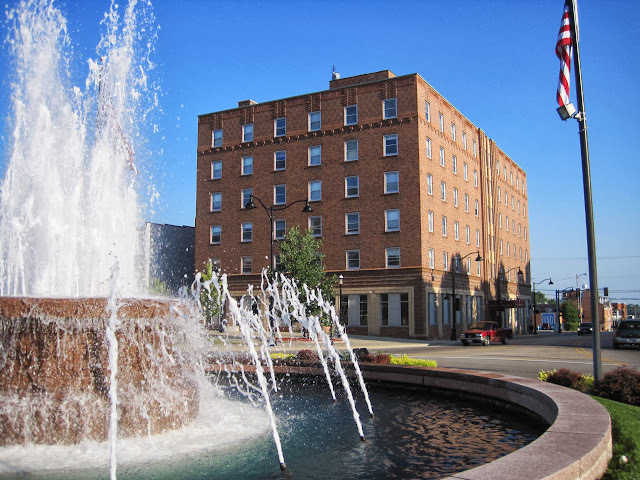 The hotel had become a civic project spearheaded by the Chamber of Commerce to provide modern accommodations to encourage business people and travelers to stay in Belleville and to attract the convention trade to town. The developers wanted the hotel to be in a prominent location so chose a site on the Public Square directly across the street from the St. Clair County Courthouse on a site associated with the hospitality industry since the 1840s. The building’s significance to the community was indicated by the presence on its first floor of the offices of the Chamber of Commerce, Retail Merchants’ Association, and St. Clair County Farm Bureau. Businesses also occupied commercial spaces on the first floor. Perhaps the most prominent was Blanquart Jewelers, which began in the hotel. Its dining room was a social venue noted for serving white asparagus, a local delicacy. The hotel was the site of weddings and social occasions as well as business meetings. Despite the Great Depression, the chamber was able to finance the $400,000 project, with $50,000 of the total raised locally. The six-story hotel had 120 rooms, most with private baths or showers. Its dimensions were 70 foot by 140 foot. The lobby had a two-story ceiling and mezzanine. Terrazzo floors are still visible. The hotel’s architect was Walter P. Manske, of the St. Louis firm of Manske and Bartling, which in 1927 designed the Marquette Hotel in Cape Girardeau, Missouri, now listed on the National Register of Historic Places. Manske said of Hotel Belleville’s style that “the ‘gingerbread’ of the past has been eliminated.” Its Art-Deco style is evidenced in the geometrical patterns formed by brick and terra cotta. Representatives of Art Deco in Belleville are rare and small: none approach Hotel Belleville in terms of size, style, or historical significance. Hotel Belleville continued to accommodate customers until 1961 when the Catholic Diocese of Belleville purchased the building and converted it into a retirement home that opened in 1962. The Meredith Memorial Home provided lodging for the aged until 2010, when the Belleville Diocese, concerned about the cost of maintaining the building, sold it to the City of Belleville. Construction of Hotel Belleville demonstrated the community’s confidence in itself and its hope for the future during times of economic hardship. It can fill that role again in our time of troubles if we have the foresight to redevelop it. Click the photo below to view more. When the Belleville Diocese sold the Meredith Memorial Home to the City of Belleville in 2010, a local resident paid off the city’s mortgage with the understanding that the building would be demolished and replaced with a park or plaza to honor the memory of his daughter. The City of Belleville had planned to demolish the Meredith Home in the fall of 2013, but at a Special City Council meeting on Sept. 18, Mayor Mark Eckert announced a moratorium on the demolition of the building until May 1, 2014, at which time it will be reassessed. The moratorium was announced in response to a citizen group's attempt to save the building and work toward developing it. Many residents had expressed concern that demolition of an intact, historic building with tax- and job-generating potential on the public square would represent a lost opportunity for Belleville — especially on the eve of the City's 200th anniversary. The building has received "preliminary status" for consideration to be listed on the National Register of Historic Places. This designation would create a 20% tax credit incentive for a developer. Please direct inquiries about potential investment and/or development of this property to Larry Betz at 618-531-7753 or bellevillehistoricalsociety@gmail.com. Learn more about the investment potential at Project Belleville.